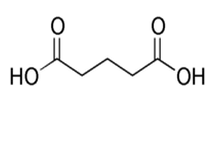 Glutaric acid (1,3-propanedicarboxylic acid) is a white crystalline solid which is very soluble in water. The compound is a useful building block for polymers, an intermediate in chemical synthesis and it is used in the manufacture of an antiretroviral drug. The compound is also used in solder flux. In our UK factory, Witton is able to manufacture glutaric acid of high purity that is free from traces of mineral acids and is thus stable when dissolved in alcohols. The product is supplied as a free flowing white powder packed in plastic kegs with anti-static liners.